You can find your peers' feedback for peer reviewed assignments in several places. Note: If the peer review is anonymous, the name of the reviewer will not be included in any feedback. 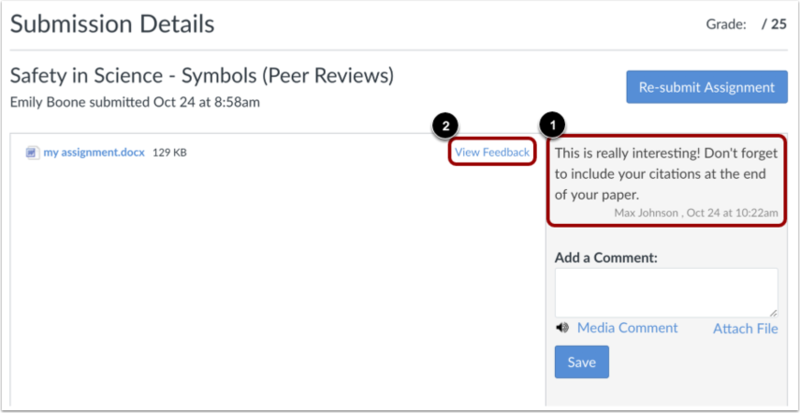 Under Recent Feedback in the sidebar of your Canvas course, you can view recent comments from peer reviewed assignments. Click the title of the assignment to view all submission details and comments. You can view the comment directly in the submission details page . If your assignment is compatible with the Canvas annotations tool, Canvas DocViewer, your peers may also have left feedback directly in the assignment. To view their comments, click the View Feedback link . This is the same link where you may be able to view feedback from your instructor. 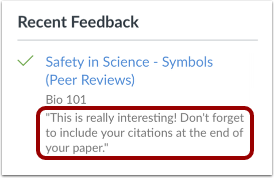 When an assignment is muted, you can view peer review comments. However, instructor comments are hidden until after the assignment is unmuted. When peer reviews are anonymous, you can leave submission and rubric comments, but annotated submission comments are not supported. You can also view your peers' feedback on the individual assignment page. All comments from your peers will appear in the Submission box. The comment can also be viewed on your Grades page. Previous Topic:How do I submit a peer review to an assignment? Next Topic:How do I upload a file as an assignment submission in Canvas? Table of Contents > Assignments > Where can I find my peers' feedback for peer reviewed assignments? Re: Student cannot view peer review that I assign manually?